Christmas came early to our home this year, and I’m so happy about it! In the past, I typically have not decorated until closer to Thanksgiving (or even after Thanksgiving), but this year, I am so glad our halls are decked! With four children and a large family that surrounds us locally, Christmas at our home is a very special time. From hosting our family’s annual Gingerbread house decorating party and cuddling up on our sofas by a warm fire, to playing some of our favorites Christmas songs and setting out milk and cookies for Santa, it’s truly the most wonderful time of the year. The warmth of our Christmas tree lights in the evenings and a Santa figurine perched by the fireplace creates wonder; Christmas has entered our home. So, welcome y’all! 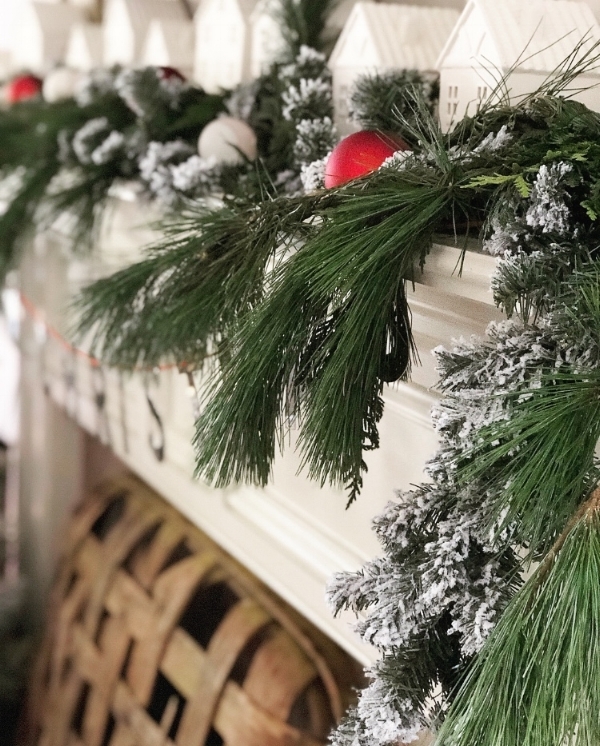 It’s a joy to have you visit our home today on “Deck the Blogs: Christmas Home tour.” Grab your coffee and a cozy blanket and join me on our home tour! Every year I incorporate holiday pieces that have been handed down to me from my family, alongside other pieces that we’ve purchased over the years, and a few new items. In addition to these, greenery is always a must (faux and real). Because I have accumulated quite a few pieces over the years, it’s helpful to choose a theme or color palette to guide my decorating. This year I chose to use neutrals with pops of red and plenty of cozy layers and textures. 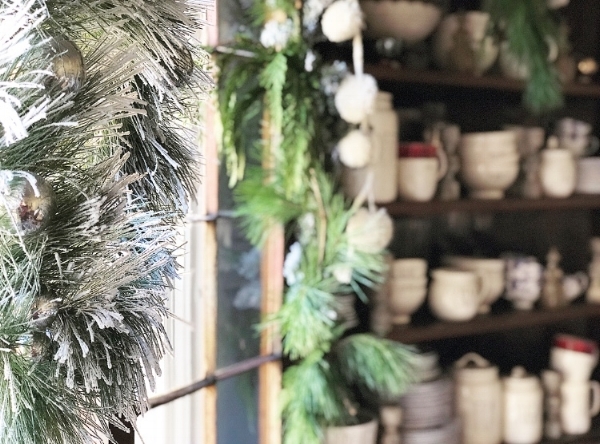 Once I decide on my color palette, Christmas décor for me is then all about using what you have in your everyday living décor and mixing it in with the Christmas items. For example, instead of my olive buckets holding cotton, it holds a mini tree, or adding seasonal typography pillows to our everyday pillow mix. As you enter our home, you can hang your coat on this rack dressed with faux pine garland and a metal MERRY CHRISTMAS sign from JoAnne’s Fabrics. I added the custom-made ticking pillow (which can be found here) for pops of red and the handmade pom-poms to the tree for cozy layers. One of my favorite tables I found pickin’ was this chippy white table. And during these Christmas days, it holds a mix of glass bottles with a galvanized bucket and mini tree. And, as you can see, it is all surrounded with a mix of fresh greenery (can be found at The Home Depot) and faux greenery. We like to get under layers of blankets during the Winter time while watching Christmas movies in this room, so our sofas always have cozy blankets for just that. I drape mine over the ends of the sofas, but you can also display/store in large oversized baskets. Blankets similar to mine can be found here. Lots of pillows make for an added layer of coziness and these typography pillows can be found here. Greenery that was flocked, made it’s appearance this year! The little tree from HomeGoods was my first flocked piece from last year, and this year we replaced our main faux tree with one that is flocked. You can find my large tree here. On my tree are ornaments that I was given since my childhood from my parents, and ones that my husband and I have collected since we married. We carry on this tradition with our own children, gifting them a new ornament each year. It’s always fun to pull them out year after year, and one day when our children have their own families, we hope they will do the same. Our fireplace is flanked with this nostalgic Santa you can find here, an old tobacco basket, a mantle full of fresh and faux greenery, and a small white Christmas village (houses from Target dollar section!). The red ornaments are also from Target, Magnolia’s Heart and Hand line found here. These shelves hold many everyday items but I’ve replaced the more spring/summer greenery with winter greenery, like the fresh and faux, flocked pine. Spreading your color palette/theme will create a cohesive look, such as adding the flocked greenery here, as well as, the houses and signs adding that pop of red. Our corner hutch was my great, great grandmother’s. I always loved seeing it in my grandmother’s home for years as I was growing up and now it’s found it’s new home with us. I like to change around what is displayed in here, and specifically for Christmas, I kept Rae Dunn pieces (note the plaid Rae Dunn pieces that add the red flourishes) and my China, but added fresh and faux, flocked greenery and these found chippy pieces from City Farmhouse’s Tent event. This table is one of my favorites. We bought it at Scott’s Antique Market in Atlanta years ago. It served as my husband’s workbench for a while, before earning a second life as a serving table in our Dining room. Sitting atop is this oversized barn wood clock that I had custom made from a neighbor and added the rusty numbers found here. The sleigh adds so whimsy to this space. This hutch holds the bulk of my Rae Dunn collection. I enjoy displaying it as a collection, along with my mini rolling pin and pitcher collection. I simply added some pops of red and snow globes for some kid friendly elements. The pennant banner adds another layer of texture for that finishing touch. Creating and decorating Gingerbread houses with our children and nieces/nephews is a family tradition, one that my grandparents did for my cousins, siblings, and myself. One of the things that makes it special is using my grandmother’s recipe for Royal icing. I’ve included the recipe below (written in my mother's handwriting) for you all to save and make with your own loved ones. It has been a joy having you tour our Christmas home today! My hope is that you were able to relax and connect with your own home in mind. By using items you love, whether old or new, is sure to bring joy to you while you decorate this holiday season. I'd love to hear how you incorporate Christmas into your home; please share with me in the comments below! May your home be filled with the wonder and festivity of this special season. Below are 10 more Christmas Home tours that you do not want to miss! These talented ladies will bring beautiful Christmas inspiration to you! Just click on the banner and you'll be taken to their Christmas Home Tour! Enjoy!